The Latest News is that Madhya Bihar Gramin Bank (MBGB), Patna had conducted interview from 09th February 2015 to 17th February 2015 for 100 posts of Officer Scale I at MBGB Head office, Patna. MBGB has released Interview result / List of selected candidates who are given area wise allotment along with Joining Date which is 02nd March 2015 at 10:00 AM at various stations mentioned in the official notice released on the official website. The allotment of finally selected candidates is given for 8 various regions i.e. Ara, Aurangabad, Bhabhua, Nawada, Patna, Gaya and Sasaram. The Final List of selected candidates contains name of candidates, roll number of the candidates and place of Joining for further posting at point of need. The appointment letters of these short listed candidates have been sent. 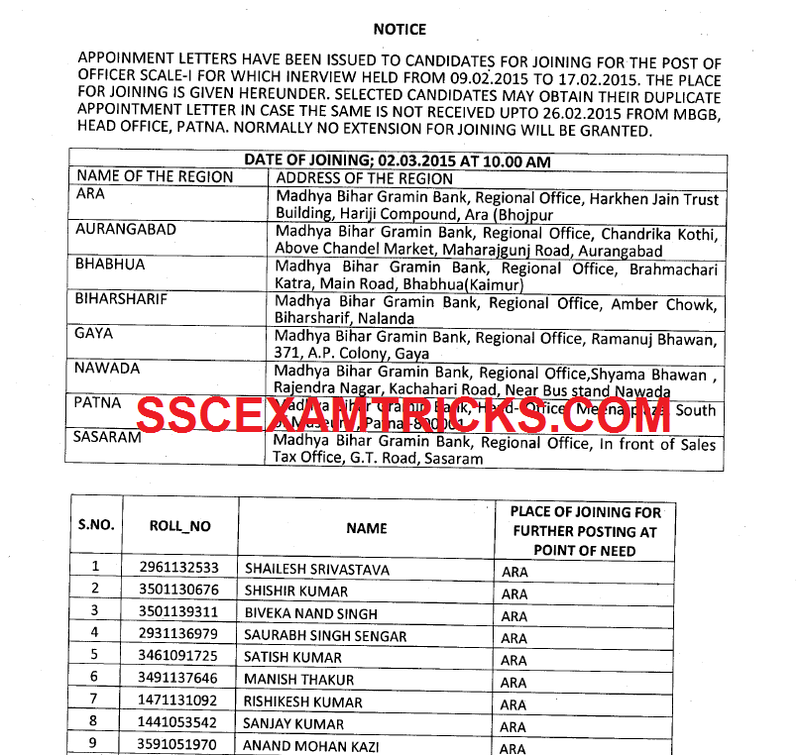 In case any candidate has not received appointment letter till 26th February 2015, these candidates can get their duplicate appointment letter from MBGB Head office Patna. The short listed candidates remember that no extension in the joining of the candidate will be granted. It is noted that All the candidates are informed that in case of any discrepancies found in respect of their identity at subsequent stages or in case of any doubt of their identity arises, they shall be held sole responsible for this act and the Bank will be free to take appropriate action in this regard. Those candidates who had attended interview and waiting for the list of finally selected candidates for the posts of Officer Scale I can download the Final list of selected candidates from the direct link provided in the end of the posts. · In case Appointment Letter not received appointment letter up to 26th February 2015 then get duplicate Appointment Letter from MBGB, Head Office, Patna. Click on the direct link provided below. Download the Interview Result PDF. Save or Print the Interview Result for interview. Now selected candidates will join on 02nd March 2015 with appointment letter which has been already issued to the selected candidates. Selected candidates are advised to bring the following documents at the time of joining. Now Final Selected candidate will have to get appointment letter which will be issued by MBGB. The date of Joining and reporting venue is mentioned on the appointment letter. Candidate must bring original documents along with a photocopy set of original documents such as 10th, 12th, Graduation, Degree or others along with domicile and caste certificate. Candidate should bring two passport size photographs at the time of getting appointment letter of Clerk Posts. Candidates are advised to bring at leave two coloured photograph, 2-5 blank A4 size paper sheet at the time of getting appointment letter/joining to the station (for writing joining application). 5. DECLARATION OF FIDELITY AND SECRECY. 6. DECLARATION OF MARITAL STATUS. 7. INDEMNITY BOND WITH SURETY.